The purpose of OBA-cb Demo Application is to provide a generic, fully functional, transparent environment that supports all operations related to the opening of a cross-border bank account, as defined by STORK 2.0 e-Banking Pilot. 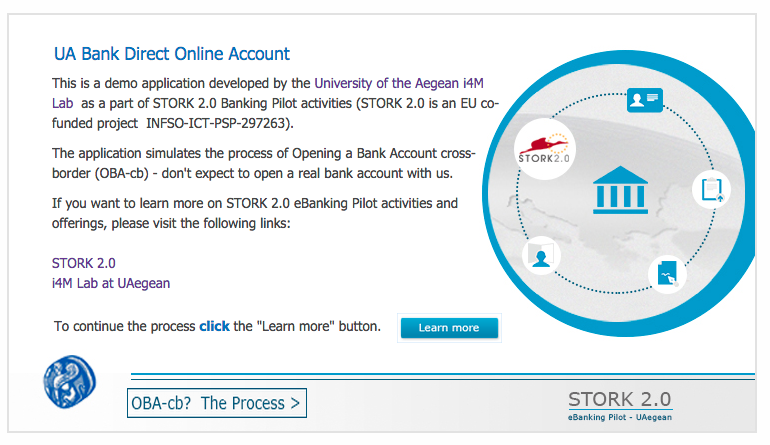 Include all the steps that a Bank needs to deploy OBA cross-border operations, by interconnecting its own IT infrastructure with STORK 2.0 facilities. To be used from any EU country, so to engage many EU-citizens to familiarize with the process of opening cross-border bank accounts. The application has been developed by a group of researchers working with the University of the Aegean.